State of the reading end of a queue (i.e., of the code calling pop()). Multiple queues attached to one reader share this state. Definition at line 27 of file Queue.h. Definition at line 57 of file Queue.h. Definition at line 58 of file Queue.h. Definition at line 53 of file Queue.h. Definition at line 47 of file Queue.cc. Definition at line 36 of file Queue.h. Definition at line 33 of file Queue.h. Definition at line 46 of file Queue.h. Definition at line 43 of file Queue.h. Definition at line 39 of file Queue.h. Referenced by clearSignal(), and Ipc::OneToOneUniQueue::pop(). Definition at line 60 of file Queue.h. 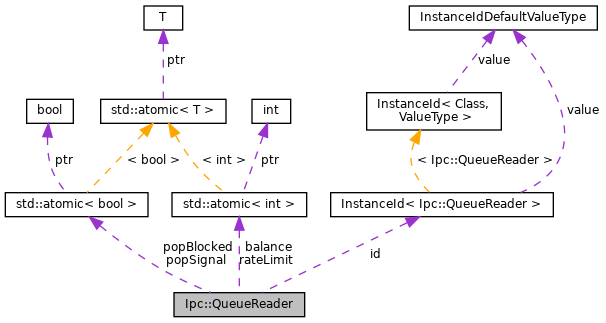 Referenced by Ipc::BaseMultiQueue::balance(), and Ipc::BaseMultiQueue::localBalance(). Definition at line 63 of file Queue.h. Definition at line 49 of file Queue.h. Referenced by block(), blocked(), and unblock(). Definition at line 50 of file Queue.h. Referenced by clearSignal(), and raiseSignal(). Definition at line 54 of file Queue.h. Referenced by Ipc::BaseMultiQueue::localRateLimit(), and Ipc::BaseMultiQueue::rateLimit().